Michael Swank of Lawrence returns the ball in a tie-breaker match Friday in the KU ITA summer circuit tournament at First Serve. The tournament is designed to bring both junior and college players together to compete at a high level. The tournament, which started on Friday, has drawn players from across the country with participants coming from Iowa, Nebraska, Michigan and Illinois. Lawrence players Michael Swank, an upcoming senior at Free State, and Keith Pipkin, a former Free State player and current Baker University player, will supply local representation. Two KU players, incoming freshman Sara Lazarevich and sophomore-to-be Erin Wilbert, will also be competing. The high level of competition could have a lot to do with the quality of the new and improved facilities at First Serve. Last October, First Serve expanded its court space to include six outdoor courts. With the new court space, KU can now also host its own larger tournaments in the fall instead of having to always travel to compete, Dalmagro said. 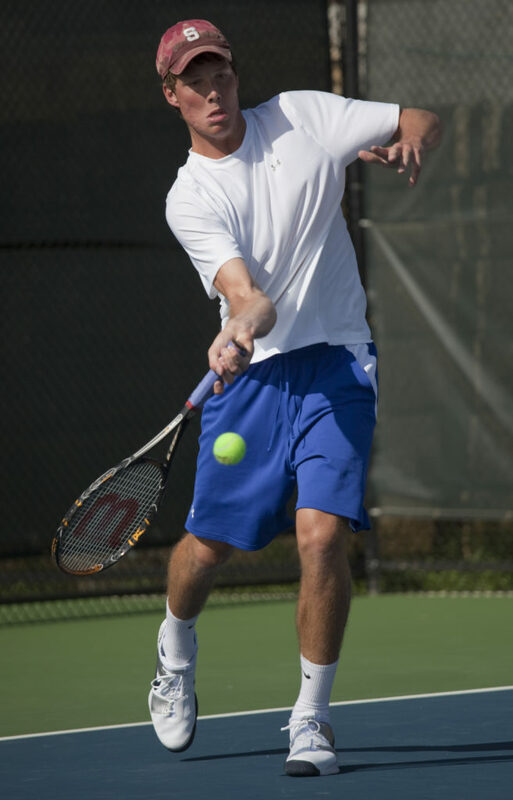 And hosting tournaments is key as First Serve and KU look to rebuild tennis in Lawrence. “I think it’s great exposure for Lawrence and the tennis community in Lawrence,” Elwell added. “You see people traveling from all over the country to play in this tournament. Tournament play will continue at First Serve through Sunday.